﻿ The Dos and Don’ts of Nonprofit Email Marketing » Red Mango Marketing! Dos and Don’ts are like the two sides of the same coin; you need both to toss up results. We are all so focused on what we should be doing that we often end up ignoring the things we shouldn’t. Fortunately, in many cases, both “dos” and “don’ts” work in parallel. When you begin email marketing for your nonprofit, there are many things that you’ll learn to do, but you also need to know the things you absolutely shouldn’t be doing. This is a big one, and can not only result in poor email performance but could completely destroy your nonprofit’s reputation. Imagine someone who received your email saying, “I didn’t sign up for this email distribution”. The next step would be to mark you as SPAM. You could even get blacklisted. Organically build your email list through permission-based methods. Give an option to voluntarily opt-in to receiving your emails and an option to unsubscribe at any given point in time. Sending emails and staying connected to your supporters is certainly a great idea. The issues begin when you start to send irrelevant information to them. This is a great way to get marked as SPAM. Also, using a ‘no-reply’ address will lead to driving away your subscribers. Always use a registered email ID, preferably a domain ID that subscribers can reply to or contact. It will work even better if the email address is from a name as opposed to an organization or acronym. Build out an email marketing plan to know how many emails you will be sending in a month. We suggest 3-4 emails if you have enough valuable content to share, or 1-2 if it’s a newsletter or promotional email. Measure email marketing metrics to know how your email campaigns are doing and how you can make them better. Most importantly, know your subscribers and send relevant content to their inbox. Every email you send your subscribers’ way must have a goal that is of value to them, or you are just wasting their time. The value could be as simple as making them feel appreciated or providing an incentive. But if you don’t add value, along with a clear call-to-action and links, no one will understand the goal of the email. Always add a clear call-to-action button so subscribers know what action you want them to take. If you are making a promise, be sure to keep it. Set a goal for every email you send and plan your design, text, images, links, and buttons accordingly. Even the most compelling donation asks, like seeking support for moving causes and requests to become a volunteer, can go straight to the trash if the design is overwhelming. Don’t go overboard, and consider every design element carefully when creating your emails. The colors, theme, fonts, text, images- everything plays a vital role in compelling your subscribers to take the action you want them too. Long and cramped emails with no images or innumerable images with no supporting text, a font that’s hardly legible, or too many colors making it a jarring visual are all “don’ts”. Use no more than two fonts that are easy to read. Use 1-2 images with clear and concise text. Make the call-to-action button pop and easy to locate. Everyone makes errors but you have a chance to rectify them if you don’t impulsively send the first email draft you create. Also, don’t ignore A/B testing and miss out on understanding what works best with your subscribers. Even after proofreading, send the email to a colleague to see how it looks and get a second opinion. Also, open the email on a mobile device to ensure it works just as fine. Try A/B testing different elements like images, subject lines, and reply addresses to know what resonates most with your subscribers. Use automated systems to check for errors before sending. Nonprofit email marketing helps you take your efforts to the next level. You spread the word about your initiative, welcome people to hop in and make a difference, drive a real change, and make this world a better place. It’s a wonderful feeling to grow and achieve your goals, but it’s even better when there’s nothing pulling you back. Knowing what you should be doing is as important as knowing what you shouldn’t. It’s okay if you make a few mistakes if you are willing to rectify these and move ahead stronger. The final and most important ‘Don’t’ to add to this list is: DON’T give up on email marketing. 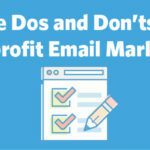 The post The Dos and Don’ts of Nonprofit Email Marketing appeared first on Constant Contact Blogs. This entry was posted on Friday, October 5th, 2018 at 9:39 am	and is filed under Email Marketing, News & Updates, Nonprofit. You can follow any responses to this entry through the RSS 2.0 feed. Both comments and pings are currently closed.